One of the rules that forms the foundation of Euclidian geometry is “the shortest distance between two points is a straight line.” In the case of racing, there is a modern corollary which is “the shortest distance from start to finish is on the course.” Now, before everyone does a gasp and shakes their head in disbelief, I did stay on course, for the third time in three races this season, and again it proved to be a much more successful race strategy than that which I employed during several races last season. 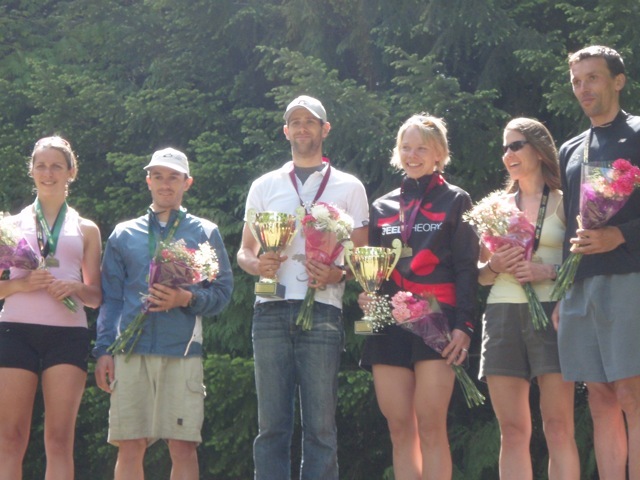 The race itself took place on a course that Coach Joel sends out to ride quite often – the 22km loop around Shawnigan Lake, which sits down in the Cowichan Valley, northwest of Victoria (mostly west). It’s really a beautiful area, one that I forgot to take pictures of. So just imagine a typical lush forest surrounding a lake in the Pacific Northwest, and you’ve got the idea. I felt quite fast and strong during the swim, but unfortunately, the clock revealed that perception really is quite fallible, since what I thought was a pretty good swim turned out to be rather slow. I’ll just tell myself the course was a bit long (despite the fact that the lead swimmers went fast enough to show that it really wasn’t). I have ordered Joel to make me a faster swimmer, so let’s hope he listens. If I start coming out on the swim closer to the front, you’ll know that he did. Out on the bike course, it was a steady march to the front, as I pretty much even split each of the four laps. On the last lap, the rolling course around the lake took its toll on me as I didn’t have the sharpest legs to punch it up and over the top of the rollers. That’s the cost of doing Ironman – good fitness, but not too much top end. However, it’s amazing how much having a tricked out chariot can smooth over the blips in how you feel as I rolled into T2 with just under a five minute lead over a chase group of three other athletes. Out on the run, which took place on one of the many shale trails that dot the Vancouver Island landscape, I focused mostly on keeping my turnover up. Running these trails, it’s hard to really push off, as the ground is quite loose. So footspeed is critical to racing well. Through the turnaround at 6km, I clocked out a lead of just under four minutes on the chasers. My legs continued to hold up well, and my occasionally ornery feet seemed very happy in my new racing flats. Finally! (For those wondering, my new shoes are the Saucony Type A2, which I’ve really, really working out in. These are easily the best flats I’ve ever run in.) At the second turnaround at 16km, the chasers had split up, and at this point, I had roughly three minutes on eventual second place finisher Andriy Yastrebov of the Ukraine. At Ironman Canada last year, Andriy ran me down in the last 5km, which was at the forefront of my mind as I passed through the 16km turnaround, which is, of course, 5km from the finish. So, despite wanting nothing more than to relax a bit, I forced myself to pick up the pace. In this case, unlike with the swim, perception was actually rewarded as more effort and feeling fast actually translated to more speed. With the fast last 5km, I achieved two things. Firstly, I was able to stretch out my lead again, and crossed the line just over four minutes ahead of second. And secondly, I was able to put myself in a world of hurt, which made me seriously rethink the intelligence of deciding to do another half this upcoming weekend. It was nice to execute and to do what needed to be done to win. I was also ecstatic to have shoes that didn’t demolish my feet. And, yet again, I was ecstatic with the performance of my bike. This bike (and by bike, I mean everything – the frame, the wheels, the aerobars, the components) is really quite amazing. And, of course, I was overjoyed to have abided by the rules of Euclidian racing. Sweet results, somebody is turning into a superstar – u should get the number of the chick to your left. Are you doing Oliver next weekend? If so, I plan on making you feel like a superstar by asking for your autograph! AWESOME job, bro! I love how you put <>even more time<> into the chase pack over the last 5km of the run. It ain’t “just smash the bike and hang on” by a long shot!